Dale and Laurie Edwards have been married for 30 years, and have two children Daniel and Beth. A graduate of Berkshire Christian College and Gordon-Conwell Theological Seminary, Dale was pastor of the First Baptist Church of Lebanon N.H for 25 years. During that time he also served for several years as pastor of Logos Community Church, a mission congregation of the Korean Presbyterian Church meeting at Dartmouth College. Dale enjoys traveling about the Region, visiting with pastors and churches. His ministry has been dedicated to church renewal in New England. For hobbies, Dale gardens, hikes, and collects old Moxie bottles. ​Sue began her ministry in New Hampshire 29 years ago as a pastor's wife. After a number of years in public and private education assisting students in the college application process, it feels good to Sue to be back in Christian ministry and looks forward to supporting the people and churches within our region. She has been married to Bob for 32 years. They have 4 awesome children (one by marriage), and just over a year ago purchased their own home after living in parsonages for most of their married life. The list of renovation projects is taking shape! Bob is about the numbers! 27, 4, 2, 30, 3. Bob has over 28 years in the pastoral ministry. A graduate of Bentley College and Gordon-Conwell Theological Seminary, he maintains a fascination with technology and love of local communities of Christ. Bob and Sue have celebrated marriage for 30 years and spend their time rooting three adult children through life. Bob is also a bookkeeper/office manager for another company in Lebanon. He enjoys playing guitar, singing, coaching, golfing and fly-fishing. ​Kathleen is excited to join in helping the region and the churches in connecting with one another! Kathleen married her high school sweetheart, Chris, 13 years ago. Together they attended and graduated from Gordon-Conwell Theological Seminary in 2009 and were ordained in that same year. 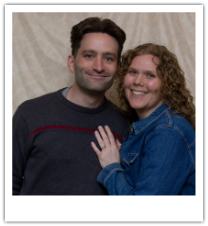 They have been co-pastors since 2010 at First Baptist Church of South Londonderry, Vermont. They have three children: Sarah, Daniel, and Priscilla. In her free time she likes to bake bread and to go camping with her family. ​Abraham lives with his wife Amanda and their 6 children in Cavendish, VT where he serves as pastor of the Cavendish Baptist Church. He is the coordinator for 25 to Life, a group interested in long-term pastorates. He also serves as chaplain of his town's volunteer fire department. Dr. Ronald Bouthillette is the lead pastor at The Bridge Community Church in Milford, NH and is an Adjunct Professor of Practical Theology at Gordon Conwell Theological Seminary. He is a graduate of Florida Bible College (BA), Gordon Conwell Theological Seminary (MDiv) and Luther Rice Seminary (DMin). He has been a pastor of churches in Midwest and the East. His passion is church revitalization in the New England region, and mentoring new pastors. He is married to Cathy and they have two children - Erich and Rachel. Erich lives in the Boston area, married to Joanne and they have three sons. Rachel is married to Rick Drew and they live in Murfreesboro, TN and they have a son and two daughters. ​Jim brings 35 years of pastoral ministry (23 with ABC-VNH) to his role of assisting churches in finding pastoral leadership. Jim has also served the Region as president, 1st VP, 2nd VP, and chair of the Department of Professional Ministry.